Are you interested in dog tattoos? Find some great inspiration for your own tats, and even learn a little about having your dog tattooed. There are so many ways you can go when contemplating getting a dog tat. 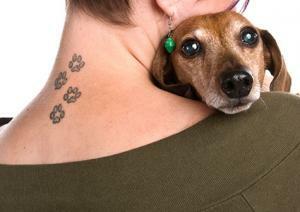 Here are plenty of ideas to fire up your imagination and help you create the ideal tat to honor man's best friend. Undoubtedly, many people have had a canine companion that turned out to be one of the greatest friends they ever had. If this is your case, why not take one of your favorite photos and have it turned into a tattoo? You can keep it simple with just your dog's face, or you might want to go with a larger design that includes some of the background from a candid shot. You might also decide to include other elements in your body art such as your dog's favorite toy or bone. Is there a particular breed to which you feel devoted? 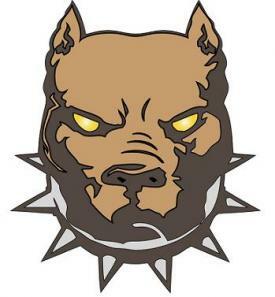 Find a good image at a dog breed website and ask your tattoo artist to turn it into flash art. Once you have the basic dog image, you can talk about ideas to make that design more personal. Paw prints make great dog tattoos. You can choose to use a print from your favorite dog breed, or you might even take a couple of prints from your favorite pet. A single print with your dog's name added makes a heartfelt tribute. You can easily turn this type of tat into a memorial after your pet passes by adding his birth and death dates. Is it a poorly kept secret that your dog walks all over you? You might want to humorously acknowledge the fact by having your dog's paw prints tattooed in a trail across your back. Tales of a mysterious black ghost dog that appears in times of trouble have abounded for centuries. If you like the mystique attached to this legend, consider a black silhouette of an imposing breed, and give it glowing red or yellow eyes. Bulldogs have been a favorite canine symbol of the military for decades. However, other substantial breeds like Mastiffs, Pitbulls and Rottweilers also make great subjects for military dog tattoos. Give your dog a menacing grin and slap a sergeant's hat on top, or add military wings if you happen to be an aviator. Skulls are a perennial favorite for tattoo designs, so why not give your version a unique twist with a dog skull if you want one? You can go with a simple line drawing of a basic dog skull or even one of a particular breed if you have access to what one looks like. To flesh out the design, think about using it as the centerpiece of a larger tribal tattoo design. It could actually turn out quite fearsome if that's the look you want. Alternatively, you could use a dog skull to replace the traditional steer skull in a desert scene tattoo. If you're a follower of the Chinese Zodiac and you were born under the sign of the dog, this could make a great basis for a number of dog tattoos. 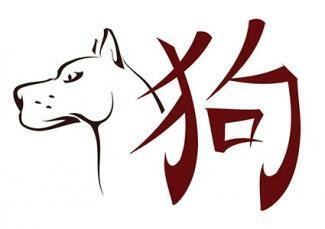 You could adapt any Asian dog or Foo dog artwork that appeals to you, or you might choose the dog kanji symbol instead. On a related topic, yes, you really can have your dog tattooed. Tattooing a dog for identification purposes has proven a valuable resource for recovering lost pets. Dog shelters can check new rescues for identifying words or numbers and compare them to a national registry like Tattoo-A-Pet.com in the hopes of reuniting these animals with their owners. Such identifications are usually inked on an ear flap or the dog's tummy or inner leg. Although the process is a little uncomfortable, it could be invaluable if your dog is ever lost. Your local vet can provide more info. Check out these galleries for more canine inspiration.